Editor’s Note: Names of retreat participants have been changed to respect the privacy of the individuals and the confidential nature of the retreat experience. On a beautiful summer morning, Darlene and her neighbor were on their hands and knees pulling weeds from the flowerbeds that they tended between their two houses. Darlene worked 12-hour shifts and didn’t have much time for anything besides work and these few precious hours in the garden. On this particular day, however, her neighbor made her an offer that changed all that. 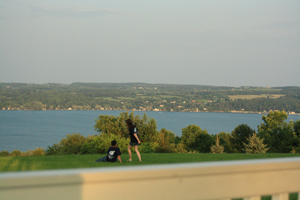 The group spent the weekend at the Redemptorists’ Notre Dame Retreat House in Canandaigua, NY, and the weekend “opened up a whole new area” for Darlene. Thousands of people just like Darlene take time out every year to attend a Redemptorist-led retreat. No matter the theme, the season or setting, each retreat offers a unique experience – one of unconditional welcome and a life-changing encounter with a loving God. 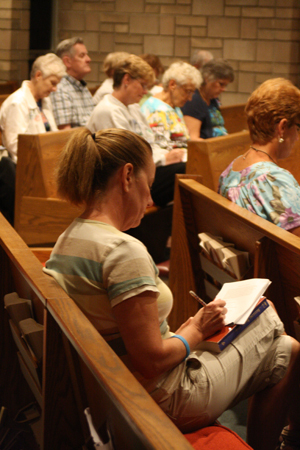 Retreat ministry has long been part of the Redemptorists’ mission. When St. Alphonsus Liguori founded his spiritual family in 1732, their main ministry was preaching missions, a sort of extended retreat, in the rural areas outside of Naples. Retreats for religious sisters and priests, and eventually for lay people, quickly became a natural complement. These forms of “extraordinary preaching,” that is, the telling of the Good News outside of the usual setting of Mass, continue to lie at the heart of Redemptorist life. “It was this ‘you better do this or you’re gonna go to hell’ image of God, and it scared me as it would scare a lot of kids,” she said. 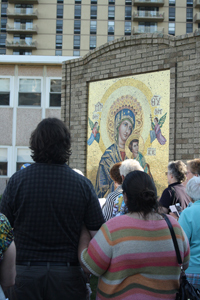 But about 20 years ago, during a dark time in her life, a friend told her about the Matt Talbot retreats held at the Redemptorists’ San Alfonso Retreat House in Long Branch, NJ. The friend encouraged Meg to attend, enticing her with the scenic location on the northern New Jersey shore. In addition to Matt Talbot retreats, San Alfonso offers more than 40 retreats every year, including retreats for religious sisters, charismatic retreats, and time for groups like Cursillo. Meg, who’d been looking for a place to spend some alone time, agreed to try it out. Matt Talbot retreats began in 1943 in Morristown, NJ, and are offered specifically for recovering alcoholics. The Redemptorists got involved in Matt Talbot retreat ministry more than 40 years ago thanks to the efforts of Father Joseph Kerins. Father Kerins was the provincial superior at the time, and himself a recovering alcoholic. Eventually, he began recruiting some of his Redemptorist confreres, several of whom were also in recovery, to participate in and lead the retreats. Father Gerry Chylko, as a newly ordained Redemptorist, was one of those confreres persuaded by Father Kerins. Recently sober himself, Father Chylko agreed to help Father Kerins with confessions at one of the retreats. He’s been leading them for the last 30 years. Matt Talbot retreats welcome participants of all faiths or no faith, and rely heavily on the familiar 12-step program. But the Redemptorists manage to sprinkle a little theology in their talks, and Mass and confessions are offered for those who want to participate. Rob also described the retreat as a time when participants often find themselves helping each other. Anne had wandered away from the Church and run into several dead ends in her life, including an addiction to alcohol. She had married young and been divorced, and was convinced she’d never be able to receive the sacraments. A friend encouraged her to attend a Matt Talbot retreat at San Alfonso, and she agreed. The retreat was to end with Sunday Mass and lunch. Anne’s friend encouraged her to meet one-on-one with one of the priests, but Anne was reluctant. As they were heading to the chapel for Mass, the pair bumped into Father Joe. Anne shared her story, and her pain over not being able to go to Communion at Mass. Father Joe offered some advice, and encouraged her to talk to her parish priest about getting an annulment. Read more retreat stories here.